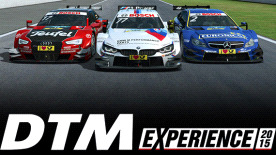 Developed with input from real DTM drivers such as Bruno Spengler and Daniel Juncadella, the DTM Experience 2015 builds on the success of previous DTM experiences and adds all the 2015 cars from Audi, BMW and Mercedes as well as refined physics, improved sounds and updated tracks. This is the pinnacle of high tech touring car racing. Recreated to the smallest details, these DTM cars are faster than ever, and now they are yours to tame. So buckle up and take on the 2015 challenge. Features all 2015 regulations and of course action. Lots of action.